I highly recommend a ride on Detroit's People Mover as it offers a stunning view of the downtown area, good and bad, that will not hide the promise and struggle facing our city. Continue the Tour with "Here Today, Gone Today"
Followed by "Art Among the Ruins"
Click the Express Button Below. 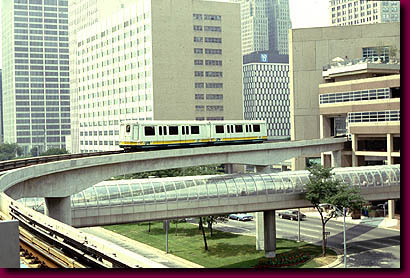 Detroit's elevated People Mover rolls into the Renaissance Center. The key link in establishing mass transit into the downtown area, it was to be the hub of a radiating light rail mass transit system. Severe recession and political infighting in the 70's left the plan stillborn with only the 3 mile People Mover loop built. Still, it has greatly enhanced mobility in the downtown area in spite of being derided as "The Train to Nowhere". If you come to Detroit, make sure the first thing you do is ride the people mover around for a couple of laps. It will be the best fifty cents you ever spent. The views are spectacular and you will witness the tragedy and triumph of Detroit.